I travelled down to Plymouth on the Friday morning, catching a train from High Brooms in order to arrive at Paddington station in good time for the 11:03 departure. 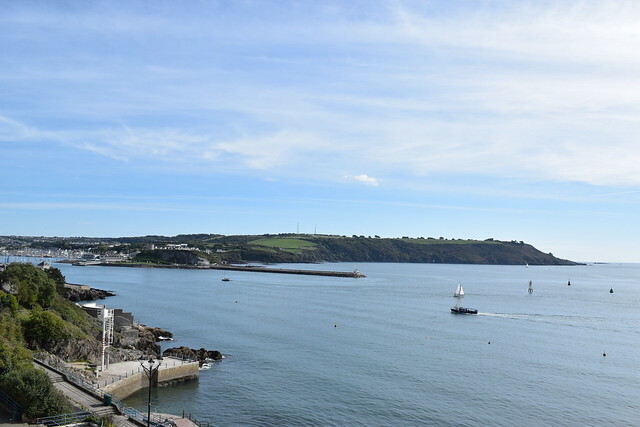 I arrived in Plymouth soon after 2.30pm due to a slight delay on the journey and was checked into my hotel room (The Duke of Cornwall) by 3pm. I took a leisurely stroll around the City centre and grabbed a small bite to eat in the evening as I had already consumed a large penne, basil, feta & mange tout meal that I had prepared that morning on the train! My plan for the Saturday was to pay a visit to PlymValley parkrun and although I did manage this, I experienced one of my worst night’s sleep on the Friday. I went to bed at 10.30pm and could hear a constant bassline from a club in the distance and this continued, without interruption until 4am – during which time I did not get a wink of sleep! I managed to drift off for no more than 2 hours and awoke at 6.30am in order to make it down for breakfast at 7am and then catch a 7:55am bus. I complained about the noise in the morning to the staff on the front desk and they were very good in accommodating my request for a room move as I couldn’t afford to have another bad night’s sleep on the Saturday evening ahead of my 10k race on the Sunday morning. Upon disembarking the bus at 8:15am, I walked the mile and a half along cycle route 27 and alongside the vintage Plym Valley railway line. The forecast for the Saturday was drizzle first thing followed by an hour or so of heavy rain before clearing to an overcast afternoon. However, I was fortunate in that the heavy rain never materialised! Conditions for the parkrun were ideal, cool with very little drizzle. 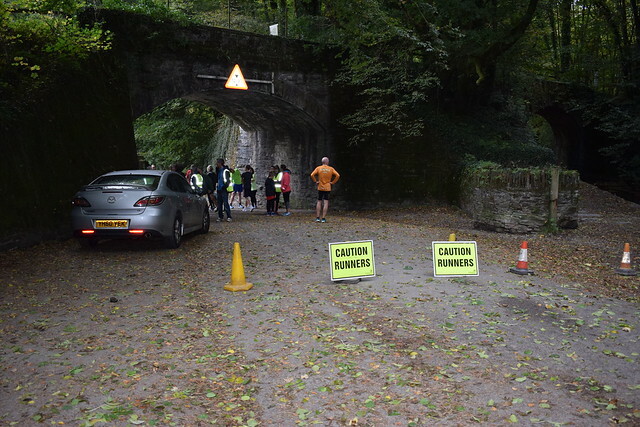 The run itself is in quite a remote but very beautiful location and takes participants through the National Trust owned Plymbridge woods. The course is uneven underfoot with numerous pieces of slate (which were quite slippery in places) scattered alongside some of the paths and although the majority of the route is flat, there is a sharp & steep incline to navigate (twice) which soon flattens out and then takes you steeply back down onto a tarmac surface. My plan for the run was to take it easy, especially so as I had such little rest the night before, then push on for a quick final mile. I felt surprisingly good throughout and although the course came up very short of 5k (2.97 miles on my watch), I finished with a time of 19:37 with mile splits of 7:05, 6:45 and 5:47 for the last 0.97 of a mile. 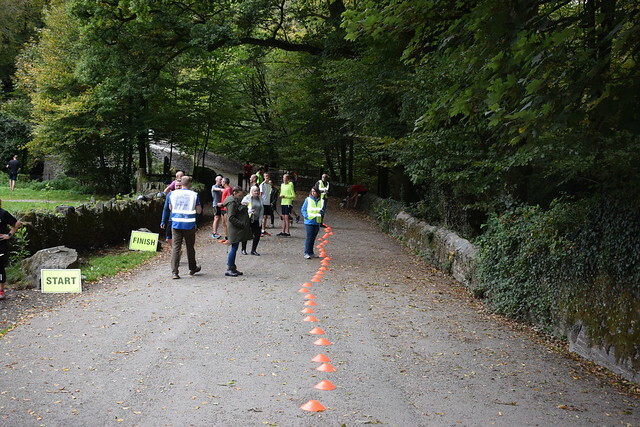 Despite the relatively remote location, there was a good turnout of 196 walkers, joggers & runners and as with all parkruns there were people of all ages, shapes and sizes. A nice touch after the finish was that there was a tub of home-made fudge – I’m not sure you’ll get too many other events with such a treat (well, certainly not away from the South-West of England) – so I duly helped myself to a piece (or 5). I returned to the hotel at 11am and was informed of my new room, which was on the 4th floor and more towards the rear of the establishment (my previous room was on the first floor and at the front, directly above the main entrance). Having originally booked a single room (and requested a bath), I was pleasantly surprised upon checking in to my new room to see that I had a twin suite – 2 single beds, a bathroom with separate shower and bath, plus a separate room off to the side with its own television, arm chairs and desk! Why have one tv when you can have two?! I had a long soak in a hot bath and immediately relaxed in bed for a couple of hours, trying to catch up on the lost sleep from the previous evening. A quick wander around the City and a small bite to eat followed before I returned to my room in the afternoon for another rest and relax before the hotel dinner which I had booked for 7pm. The AA-rosette awarded restuarant had a limited menu but I was drawn toward the wild mushroom orzo pasta with parmesan – and I wasn’t to be disappointed! The food was very good and I also indulged in a dessert, and iced berry parfait (with almond sponge, honey yogurt dressing and fresh berries). The food was excellent and along with a soft drink, the bill only came in at £21.80 which I felt was very good value for money. After dinner, I retired to my room where I relaxed before turning in for the night at 9.30pm. I awoke the following morning at 6am having had a much better night’s sleep. As breakfast wasn’t served until 7.30am on the Sunday, I knew that I would need to snack on something small to see me through the run and so ate a blueberry and honey flapjack at 6.30am alongside a cup of tea. Soon after 7am I had a hot bath and then did some foam rolling at 7.30am before making the short walk from the hotel to the start area. 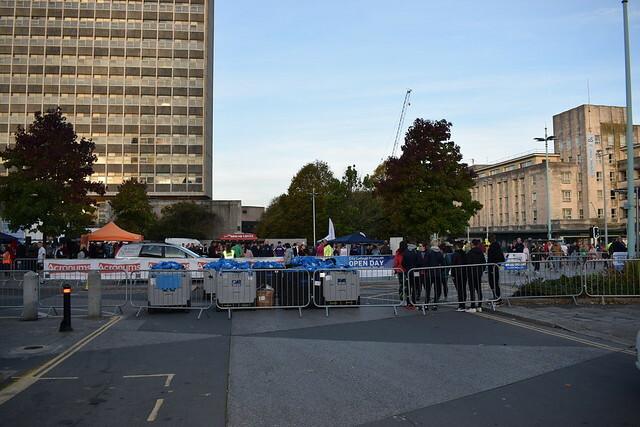 This was to be my 3rd time at the Plymouth 10k, having previously run it in 2014 and 2016, however, the organisers had taken on board feedback from previous entrants and altered the course slightly to make the start and finish areas more central and spectator friendly. 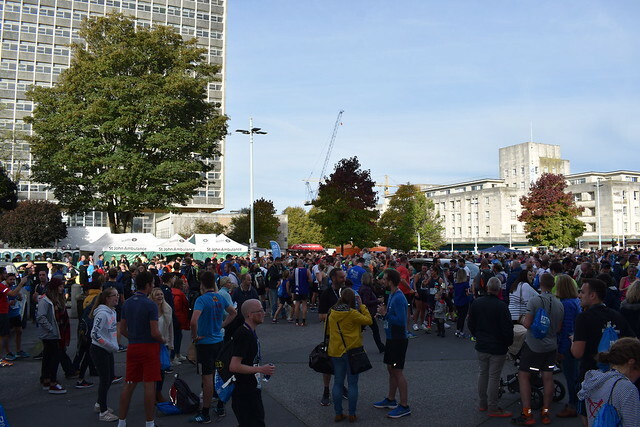 The bag drop experience was very easy and I was away from the race HQ soon after 8am in order to do my warm-up, dynamic stretches and strides, arriving at the start line at 8.20am ready for the 8.30am start. Conditions for the run couldn’t have been more perfect – dry, bright and cold with no wind. I knew what to expect from the course, being undulating in nature, and set myself a goal of finishing in the top 20. I felt that I might be capable of achieving an overall 10k pb and possibly a time sub-38 minutes. Throughout the race I felt strong and managed to run a fairly even pace. I overtook runners throughout and was only overtaken by two people in the final 400m or so (clearly runners who had not run as hard as they could earlier in the race). As I approached the finish line, I looked up at the clock to see that it had ticked over 38 minutes and as I checked my watch (for the first time since I started the race) to see my finish time, was very pleased to have run my second fastest 10k ever, with a time of 38:17. Upon checking the results this afternoon, I could see that I had finished in a very respectable 33rd position – not quite the top 20 that I had targeted, but a good result nonetheless. On reflection of the race, I felt that I performed the best that I could on the day and despite the poor night’s sleep on the Friday night, my preparation leading up to the race was excellent. I now look forward to getting stuck in to the cross country season, of which my first race is next Saturday (13th October 2018) at a new venue near Canterbury. This will be the first of 4 Kent Cross Country League races. The second fixture comes a fortnight later, at Somerhill school in Tonbridge, with the 3rd race in November and the final one in February 2019. I will also be competing in the Kent Cross Country Championships on the first weekend of January, the South of England Cross Country Championships on the final weekend in January, finishing off with the National Cross Country Championships at the end of February. In amongst the cross country, I have a 10k road race in November (Brighton) a 10 mile road race in December (Staplehurst) and a 10k road race in January (near Chepstow) all of which will lead me up to my second marathon attempt in April 2019. If you have made it this far in this blog post, then thank you very much for reading and I hope to provide an update before the end of 2018. Until then, all the best with your running endeavours and, keep on running!